RH 1A - Reproduction Arts and Crafts handle with precise incised floral details. Elongated door handle Brass �.75 each. Copper or Silver Plated �.10 each. Large drawer Handle and backplate. Brass �.75 each. Copper or Silver Plated �.10 each. Small drawer Handle and backplate. Brass �.75 each. Copper or Silver Plated �.50 each. Measurements are next to image. RH 2A - Reproduction Liberty and Co handle set from a bureau bookcase. Door handle Brass �.10 each. Copper or Silver Plated �.90 each. Drawer handle Brass �.10 each. Copper or Silver Plated �.90 each. Drawer handle Brass �.10 each. Copper Plated �.90 each. Drawer handle Brass �.10 each or Silver Plated �.90 each. 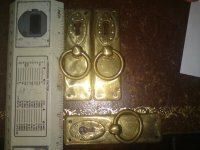 Door or Drawer handle Brass �.10 each. Copper or Silver Plated �.90 each. RH 5A - Reproduction Arts and Crafts door handles. RH 6A - Reproduction Arts and Crafts door handle. RH 7A - Reproduction handle Liberty and Co door handles originally from a Liberty and Co sideboard. 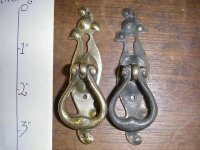 RH 8A - Reproduction handle Liberty and Co door handles originally from a Liberty and Co sideboard. Door handle Brass �.90 each. Copper or Silver Plated �.60 each. RH 9A - Reproduction Arts and Crafts/Gothic door handle.